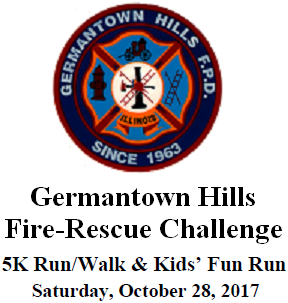 This year the Germantown Hills Fire Department will hold its tenth annual GHFD Fire-Rescue Challenge on Saturday, October 28, 2017 at 8 a.m. There will be a kids fun run and a fire demo following the race. There is also a pancake breakfast being held where all runners eat for free. Runners can enter online here through October 26, or you can also register by mail by printing this form. More information is also is available here.